Rabbit is a Lean treat! 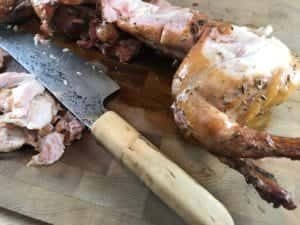 Rabbit is very lean meat and one might think it gets dry easily. Maybe so, but here is a trick. I cooked my rabbit in Monolith Kamado, spinning in rotisserie and it turned out great. There is some magic in rotisserie which I can not explain. 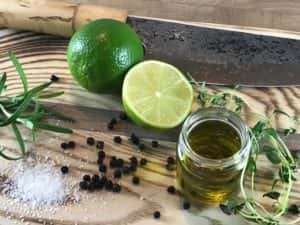 Anything I cook with it, gets juicy! 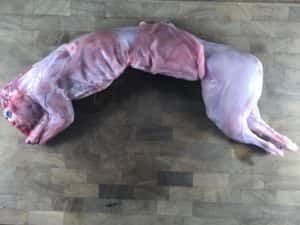 I got 4lb (1,4kg) whole rabbit from my butcher. It was fresh and packed in vacuum bag. First time cooking it, I needed to do some planning. My kamado grid diameter is 18 ½ in (47cm) and the rabbit was quite skinny and 19 ½ in (50cm) long. 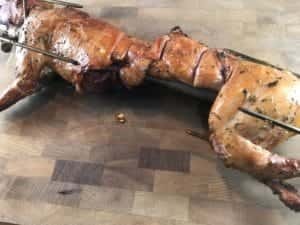 It took some work to tie it up to rotisserie skewer and keep it within space limitations. Some steel wire and thread finally did the job. But first, I decided to marinate it overnight. I washed the rabbit under cold water and placed it in sealable plastic bag. Then poured olive oil based marinade all over. Next day I took the rabbit out and wiped most of the marinade off with paper towel. I prepared my kamado for direct heat with lump charcoal. With rotisserie, I use quite low grilling temperatures. I believe ceramic kamados keep the meat from drying as the air flow through the vents is very low. So, 300F° (150°C) grilling temp was good and the rabbit went on spinning. My target temperature for the meat was 158°F (70°C). Some recipes suggested lower temps, but I trusted my plan. I also decided to give some extra flavor with apple wood smoke. One good chunk on top of the burning charcoal was enough. While my rabbit was taking a spin, I brushed it with the marinade few times. I think this might have also helped to keep the meat moist. Total grilling time was 50 minutes. I took the rabbit out and sliced it immediately. No rest. End result was fantastic. Very juicy, a bit chicken like texture and light smoky aroma. I served the rabbit with oven roasted potatoes.